Grit from the preliminary treatment process and the primary settling tanks is washed to reduce organic content and transported to the Fulton County Landfill along with debris from the bar screens. Degritted primary sludge is pumped to the Solids Holding Tank (SHT). 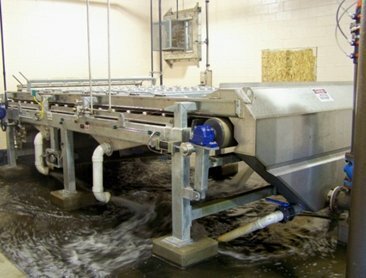 Waste activated sludge (WAS), generated during secondary treatment is also pumped to the SHT. The combined contents in this tank are kept well mixed. A centrifugal pump is used to convey this sludge mixture to the gravity belt thickener (GBT). Polymer is added to this mixture to assist in the thickening process. The thickened sludge, containing approximately 6% solids, is transported to the anaerobic digester via a progressive cavity pump. Ferrous chloride is added to the thickened sludge to reduce odors and control hydrogen sulfide levels.